If you are here, you may be considering running a self-hosted analytics platform on your own servers. It surely is the most secure and efficient way of running a web analytics tool: First of all, you know exactly where your data is kept as it is stored either on your premises or on the servers you have appointed. You also know, beyond doubt, how the data is used – whether or not it is used for other than your business’ purposes. And lastly, you avoid having to share the server’s resources with third parties, as you have your own dedicated platform. It sounds ideal, doesn’t it? It does. Self-hosting may not be for everyone, though. In this blog post we want to present you with a couple of questions your should answer before you set out to host a web analytics solution on your own servers. We hope it will help you verify whether it is worth investing your time and effort in the project, or maybe in your case, it is a blind alley you do not want to explore. 1. Is my infrastructure compatible? On-premises web analytics vendors, like Piwik PRO, usually take the whole implementation and setup process on themselves. Things may not be so easy, though, if your IT environment is incompatible with the one they have written the tool in. First and foremost, you need to see if your in-house infrastructure is compatible with the infrastructure of the web analytics vendor you are considering. This should be your first step, as it will affect your entire cooperation. Self-hosting basically means installing the web analytics software on your servers. If your system is set on a closed ecosystem, installing an external web analytics platform may not be possible at all. In other cases, incompatibility will not exclude cooperation but will definitely affect it. For example, if the web analytics provider’s operating system is Linux, and you work on Windows environment, you will not be able to perform regular installation of the web analytics platform, but you will be able to mirror it based on the documentation provided. Doing so, you will be able to tap into their know-how and benefit from all the features of the web analytics platform of your choice. However, you will need substantial IT knowledge on your side to mirror the solution and maintain it later on. All in all, the lack of compatibility is not the end of the world. If this happens to be your case, rethink your choice: How important for your business are the functionalities of the web analytics solution you have your eye on? Do you have the means to overcome this obstacle? 2. Do I have sufficient IT knowledge? This question is relevant not only when it comes to adjusting the web analytics platform to make it comply with your infrastructure, but also when, for internal policy reasons, you cannot give your web analytics vendor the access to your infrastructure. Check with the web analytics provider in question what such a remote cooperation looks like. What do the implementation, setup, and upgrade processes look like? Can you approach them with the IT skills and know-how you have? If not, are you willing to take on board a few system administrators? They will be in charge of performing maintenance tasks, upgrading the OS and application, as well as reacting in critical situations. How many would you need? Can you outsource them? Or maybe, you should give up on self-hosting? 3. Do I have sufficient computing power? You should remember that every infrastructure has limited capacity. This is particularly vital for high-traffic websites and how sophisticated analysis you want your web analytics tool to perform. It will affect not only how fast the reports will be generated and, by analogy, how quickly you will be able to translate the data into action, but also how reliable your reports are going to be. For high-performance and/or high-availability environments, you will need to set up your self-hosted web analytics on multiple servers with sufficient amount of RAM and CPU cores to handle your data collection, data storage, and data processing. You will also need redundant servers to avoid a single point of failure and thus ensure high availability. Sounds costly, doesn’t it? Well, you do get value for money. No web analytics vendor would match Google’s computing power. But, paradoxically, it may be a good thing: Google’s computing capacity comes at a price. Using Google, or any other cloud web analytics applications, you need to take into account the Noisy Neighbor Effect which results in data arrival latency issues and data sampling – something you stay clear of when hosting web analytics on your own servers. If your website generates high volume of traffic, remember that there is always the possibility of splitting the database along the way, or tapping into a hybrid architecture, like Amazon Web Services (AWS), which can extend your on-premises infrastructure to cloud in a secure way. AWS is costly but undoubtedly its pros outweigh the cons: AWS gives you the opportunity of on-demand scaling – adding a new machine takes merely minutes. 4. Will the location of my servers comply with the data privacy laws of the countries I’m operating in? One of the main reasons why multinational enterprises decide to go for self-hosted analytics solutions – apart from the need for analyzing huge amount of unsampled data – is the data privacy restrictions of the countries they operate in. There are a couple of countries that strictly prohibit storing its citizens’ personal data outside their territory – China and Russia serve as a great example. Also in the European Economic Area (covering EU countries plus Liechtenstein, Norway and Iceland) user data must be held within its borders. If you are a multinational enterprise operating in one of those regions, to remain in full compliance with their local data privacy laws, you need to brace yourself as you will have to create separate installations in a few remote locations. It goes without saying that every installation carries additional costs – purchasing another server hardware, providing high-speed internet connectivity, hiring staff with technical expertise etc. How much are you willing to invest? Here again AWS comes to your rescue. Having a robust global infrastructure, with servers located in Beijing, Frankfurt and many other cities worldwide, AWS can help you eliminate additional costs and the hassle of building and maintaining your own infrastructure in various locations. 5. Does my internal company policy allow vendors to access my infrastructure? For the fear of losing control of the data, your company may disallow giving third parties access to their infrastructure. Remember, however, that with great power comes great responsibility. In the case of self-hosted web analytics it means that you are in full control of your data… but also software updates, fixing bugs, incident handling. It seems rather effortful and in fact it is. Providing web analytics vendor with access to your server would mean receiving professional support and training. As maintaining the infrastructure and dealing with software updates and issues would become their responsibility, it would take a great weight off your shoulders. In the case of cooperation with companies like Piwik PRO you would also gain access to knowledge of highly skilled project coordinators. And your problems would be resolved immediately. For clients who can provide us only with limited access to their infrastructure. In that subscription plan, we deliver and prepare whole installation setup. The rest of the process (maintenance, incident handling etc.) is on the customer’s end. This option is dedicated for users with strict internal policies. As we are not allowed to configure setup or provide support, we deliver an extensive deployment documentation based on our best practices for the client to perform the setup autonomously and in a hassle-free way. All in all, self-hosting web analytics platform is a complex endeavor. When making the decision, you need to take into account software compatibility, technological capacity, plus international laws and internal regulations. It is undoubtedly convenient and for formal reasons it may be your only way to go. Any large or medium-sized enterprise can host a web analytics platform on their servers. The only obstacle that may come in your way is the impossibility of giving the vendor access to your infrastructure combined with not enough IT knowledge to deploy and set up the platform autonomously. 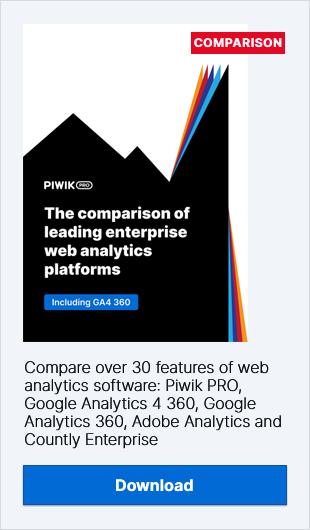 Whichever mode of Piwik hosting you choose – on-premises or cloud – feel free to get familiar with Piwik PRO Analytics Suite and get in touch! We will be more than happy to answer your questions.